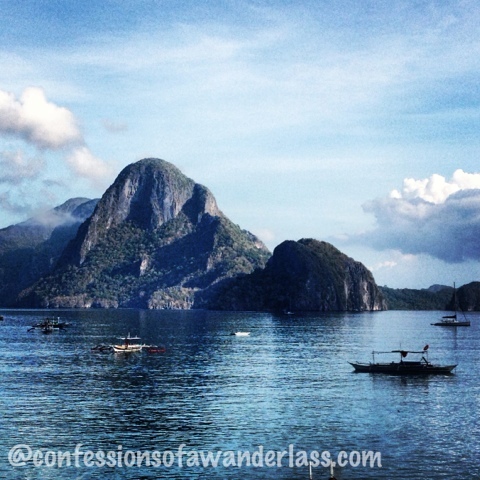 Before I could even start writing about Planning a trip to El Nido, I was back in El Nido sooner than I thought and before I could even complete my posts, summer is so in and I'm back in El Nido again! It's my third visit in 365 days and it also mean that I've spent 30 hours to and fro on the road to revisit the place. Inspite of the long road ahead, it's always worth the inconvenience. 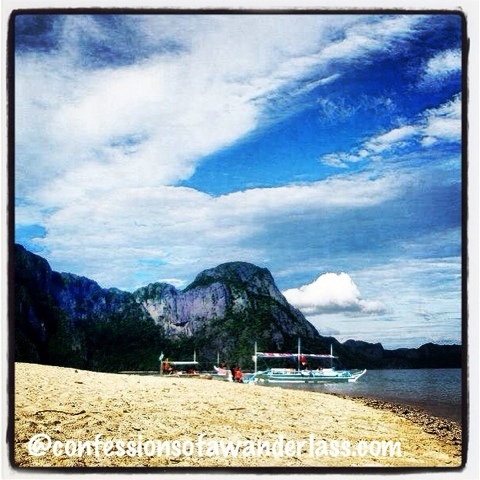 El Nido Town has a long stretch of white sand beach, overlooking the mountains of Cadlao Island. The locals look at the day's weather depending on the clouds on the highest peak of Cadlao Island. Quite a number of outrigger boats dock on the shore and noticeably waste water is thrown into the sea in some areas. Thus, I do not advise anyone to be swimming here. If it's your first time here, don't be such a loser by locking yourself up in your room or lazing around by the shore. 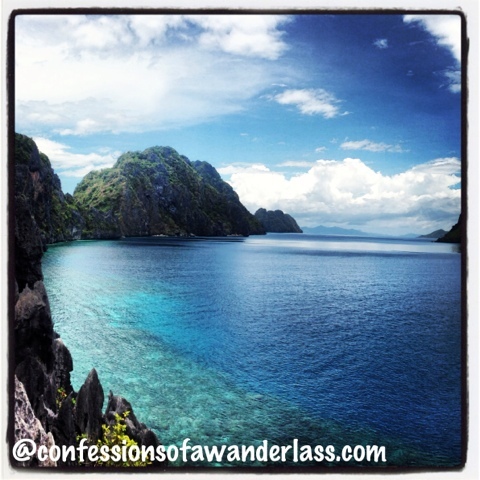 Bask in the sun and sand, hopping from one island to the next and discover the best kept secrets of El Nido. Unless you're a big group, tourists need not worry about booking a tour ahead. As soon as you get into town, there are quite a number of stalls offering tours and these stalls offers fairly the same itinerary at the same price. Pricing is practically regulated for tourists' convenience. For us, we opted to book through the hotel, I would assume, the hotel knows the service provider better. Booking through the hotel offer pretty much the same service and rate and they will take care of logistics and the bill is usually charged to the room whether it is a private tour or not. The most common tours being offered are tagged as Tour A, B, C and D. If there is anything you should not miss, is Big Lagoon and the Small Lagoon which is part of Tour A. Tour A is best, then tour C, then tour B. 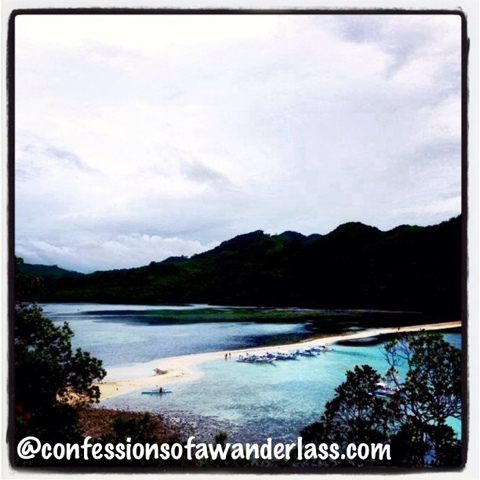 If you'll be doing more than a day's island hopping tour, I'd suggest to save the best for the last day. There is no fixed itinerary on which stop comes first, the guide normally plans the trip based on the tides, based on the volume of tourists in a stop, based on the time of the day. The tour comes with lunch which your boatman will prepare and cook in one of your stops. It's a good opportunity to try Filipino cuisine. 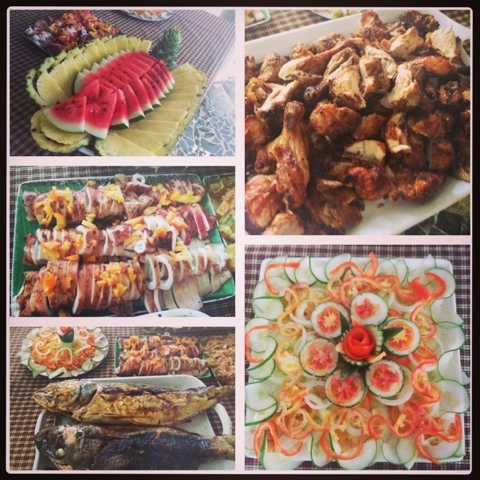 Usually it includes grilled chicken or pork, squid, fish, eggplant and tuna, cucumber salad, and fresh tropical fruits. I normally pay extra and arrange with them the day before to include shrimps or crabs in the menu. You'll be surprised by the culinary skills of your boatman. 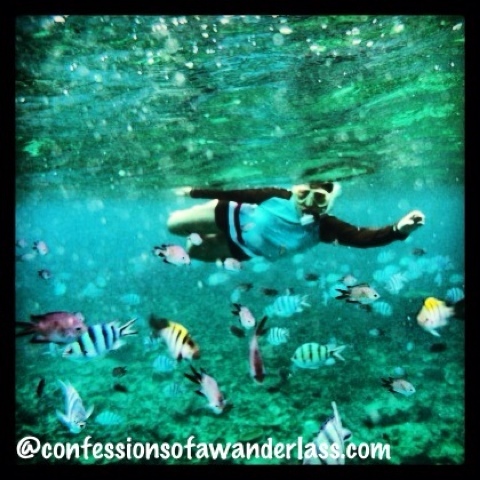 Entalula Island, my fave island lunch stop for its rich marine life, best for snorkeling. If you want to own your time, itinerary and some space on the boat, you may opt to hire a private outrigger boat like we did; otherwise, you may opt to join scheduled departures with other tourists, at 9 in the morning and ends by 4 to 5 in the afternoon. Most outrigger boats are not equipped with a toilet, if you require one, arrange in advance. The best time to visit El Nido is during the height of summer, between February to May when the sea is calm and there's less chances of rain. El Nido is famous for its lovely landscape of the numerous karst around, unspoiled marine life, sunny days and white sand beaches. 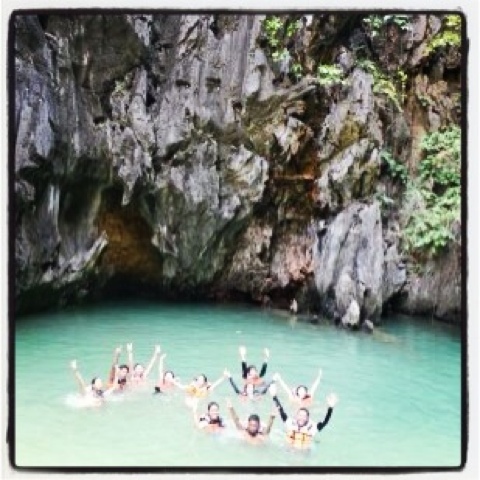 EL NIDO TOUR A, of Lagoons and Beaches. Ask any tour operator and they would suggest this tour for anyone who could only spare a day island hopping. 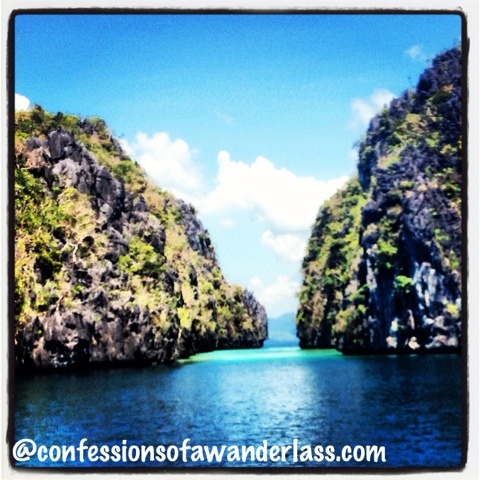 El Nido's postcards is best represented by the picturesque entrance of the big lagoon. The dramatic long and wide entrance to the lagoon pose a very nice background for any profile picture worthy to boast on your social networking site. Especially on sunny days, the clear blue skies with pockets of white clouds, creates a wonderful reflection of the karsts and trees the surrounds it, turning waters into turquoise green, just too pleasant not to paste a smile on anyone's face. Outside the lagoon was also a good place for snorkeling. The small lagoon is best explored with a kayak since the boats cannot be accommodated inside. Once a cave, however the top collapse. Now it's an open top lagoon, one has to go through a hole to enter. Shimizu Island can be a lunch stop or just a snorkeling stop. It has rich collection of fishes and corals. According to the guide, fish feeding is no longer allowed here. 7 Commando is normally the last stop of tour A. This is probably the only island that sells food and drinks (including fresh coconut at P50). It also has a beach volley for tourists to play. I did not quite like my first visit since I found it too cramped with too many tourists around, with lots of weeds on the sand and a shore filled with boats awaiting for their respective clientelle. On my second visit, three months later, I was disappointed to see heavy equipment digging up the sand, there's quite abundant amount of sand here with good commercial value at that. One year later, 7 commando became our first stop, I was surprised to see cordoned areas. The guide was quick to explain that there has been a dispute of ownership in the island. Nevertheless, with very few tourists sharing with us, I found myself loving the island. I realized that the sand was actually very fine and white and it has a long stretch of beach better than Helicopter Island, perfect for that beach themed team building activity. On a separate occasion while touring the lagoons, we had a tour extension of Snake Island which is part of tour D for an extra fee of P350 for gas. 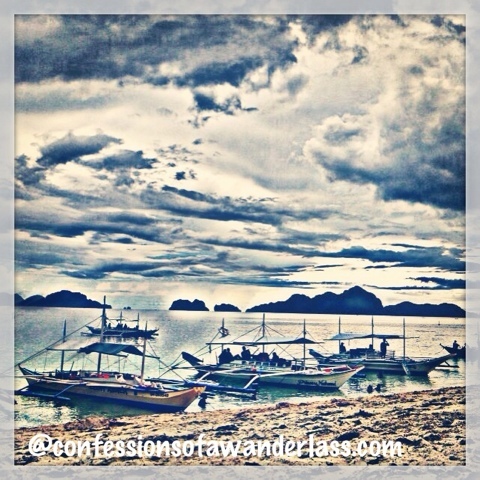 The trip to Snake Island gives you a glimpse of El Nido Resorts: Lagen and Pangalusian from afar. The Snake Island is best viewed when climbing up the cliff of its island. 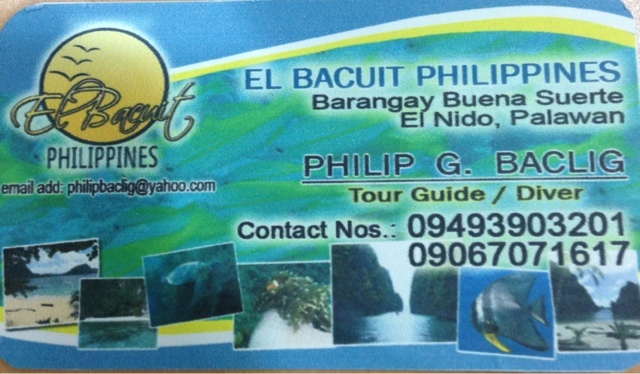 El Nido Tour C, is tagged as of Hidden Beaches and Shrines. Next to Tour A, I would suggest anyone to go for Tour C. This includes the Hidden Beach, the Secret Beach, Matinloc Shrine, Helicopter Island and a lunch stop in one of the beaches like Star Beach or Tapiutan Island. 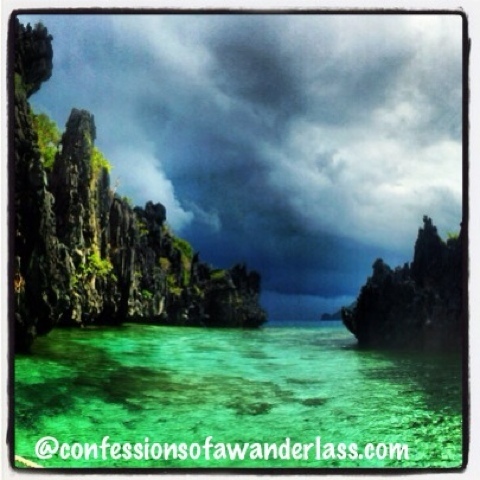 The secret lagoon was our first stop in two of my trips. It's dramatic entrance between two karst never fails to jump start the hype. The secret beach, was the inspiration of the author of "The Beach". This so called secret beach is hidden behind a karst with an opening accessible only by swimming through it's small opening. You're guide will help you through it. When inside, wonder how the tides has formed a gently sloped beach when it is surrounded with karst. But that's not it, look up and gaze at karst surrounding the secret beach, it's formation is one of a kind. 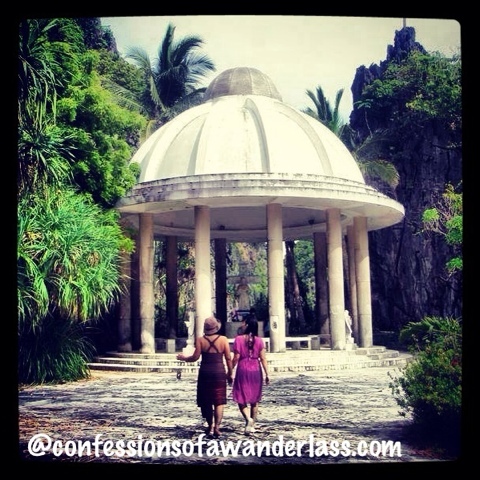 Matinloc Shrine for Mother Mary was built on a heart shaped island with Grecian architecture. Now abandoned, it left tales of gold treasures and more. In one of our visits, we've witnessed a tourist came down on her knees upon the shrine and lost consciousness saying she felt Mother Mary's presence. Enchanting! Since I ran out of batteries the last time, I could not pass the chance to climb up the cliff of Matinloc Island and capture this pretty sight. The wide shore and fine (beige) sands of Helicopter Island was a pleasant stop to just beach bum after a long day of moving from one island to the next. Before you laze and take a quick nap, go to the corner of the island and snorkel upon its rich corals and fishes, if you're lucky, you may find yourselves snorkeling with sea turtles. On a separate occasion, we have asked to include Cadlao Lagoon to our Tour C. From El Nido Town, the view of Cadlao Island stands tall. Cadlao Lagoon may not be as picturesque as the Big and Small Lagoon, it has its own charm, surrounded with karst, a good source of avian saliva otherwise commercially known as bird's nest. It was hard to just pick five, nevertheless, it's best to spend at least two full days island hopping, now, hop on that outrigger boat! Rest assured it's more fun in the Philippines.